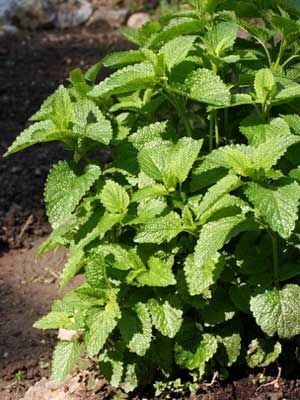 Any average, well drained soil where mint's wandering tendencies can be kept in check. Hardy even in cold climates. If desired, small plants can be potted up in fall and grown through winter indoors. Peas, Brussels Sprouts, Broccoli, Cauliflower, Cabbage, Persimmon, Kale, Kohlrabi, Tomato and Eggplant. Start with a purchased plant, or start seeds indoors and set out at about the time of your last frost. Mint is also easy to root from stem tip cuttings stuck into moist potting soil. Some strains are propagated only from cuttings rather than seeds. Frequent pinching back helps to keep plants bushy and full, and it delays flowering. Spearmint or peppermint are the most versatile strain for cooking. Gather sprigs as needed in the kitchen. Gather stems for drying in early summer, just before the plants bloom. Often becomes invasive. If possible, grow near walkways, driveways, or other hard surfaces, or in containers buried halfway in the ground.